This whole kit comes in a handy and portable blowmoulded case, just add two cordless drills, chopsaw, tape measure and pencil. 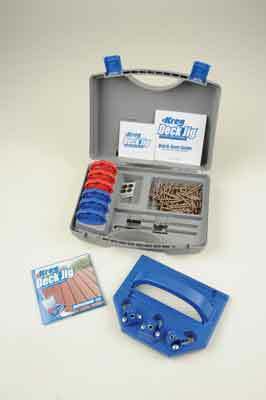 The first point to make is that you will need to purchase a box of Kreg deck screws to supplement those in the case for any reasonable size job as it only contains a sample pack. The first task is to create a suitable, level framework for the decking from treated framing timber with plenty of crossbracing. 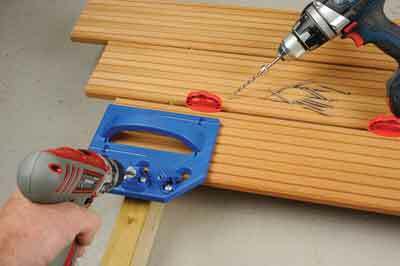 Once that is done, you can consider laying the deck surface and as far as I am aware, you can use any decking boards with the Kreg Deck Jig setup. The theory is simple but they don't give you an instructional DVD for nothing. Watch and learn as I did before you try using the kit, it will pay dividends to do so. The jig is precise. The screws are angle driven so they don't penetrate the top surface and there are no unsightly split boards or dangerous metal on the surface. Boards are spaced evenly using either of the two spacer sets and you can drive screws home on hard to reach areas. It is cost effective and the jig with its hardened steel inserts should be long lasting. An effective low cost solution that is not only good for DIYers but would suit tradesmen, too. The downside is you have to use only Kreg deck screws and you can't use the jig on the last two boards up against a vertical surface such as a wall; vertical screwing down is required here.